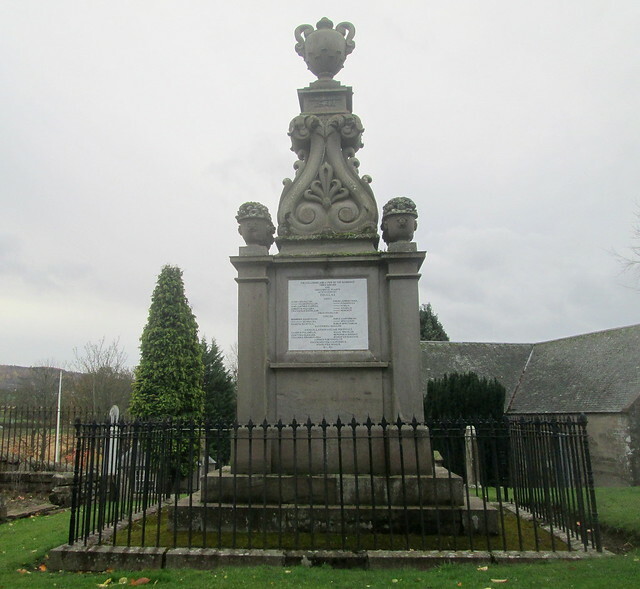 I was reading a book called Plant Hunters by Charles Lyte ( I haven’t finished it yet) and I realised that David Douglas – one of the plant hunters featured in it was born in Scone in Perthshire, a place that we often drive through. There’s actually a memorial to him in Scone churchyard so the next time we went past there we took time to go and visit it. It’s quite big! His body is actually buried in Honolulu where he was when he died – under mysterious circumstances apparently. His body was found in an animal trap pit and he had been gored to death by a bullock that had also fallen into the trap. The photo below is of the back of his memorial. As he had been visiting an Englishman who lived in a nearby hut (it was his animal trap) and the Englishman was an escaped Botany Bay convict there has always been a suspicion that David Douglas was murdered by him. 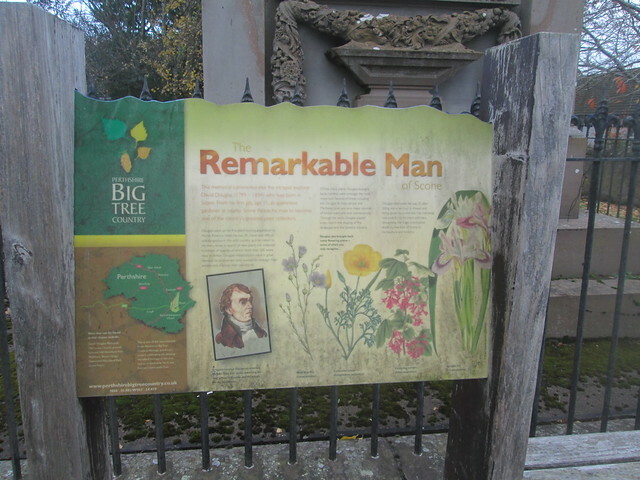 He was only 35 when he died but he had discovered so many plants and brought them back to the UK. His most famous plant introduction is probably the Douglas fir but he introduced about 240 other plants to the UK and our gardens would be much poorer without his contribution to botany. 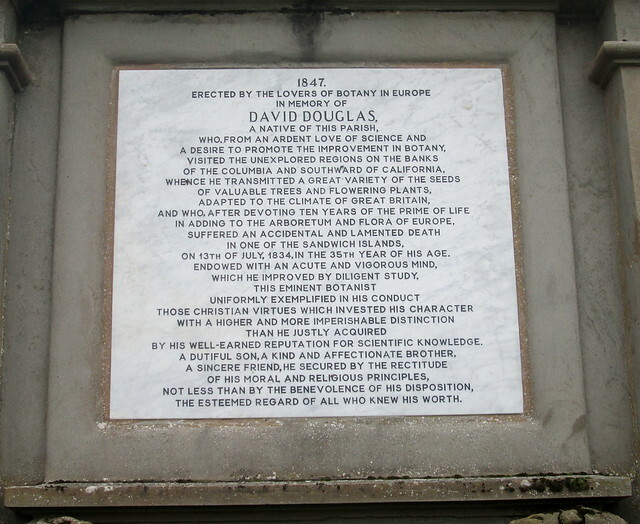 David Douglas began his botanical life as an apprentice at Scone Palace then moved on to an estate in Fife and from there to the botanical gardens at Glasgow University before embarking on his plant hunting adventures. For some reason Scotland produced more professional gardeners and botanists than anywhere else in the past, it’s something that authors have often acknowledged as so many writers of fiction have written their head gardeners as being Scotsmen, including Angela Thirkell. Plant hunters still exist today and sadly in 2013 a young Scottish plant hunter who came from a family with a long botanical history disappeared while on a plant hunting mission in Vietnam and his body wasn’t found until two years later. It’s thought that he died from natural causes after a fall. 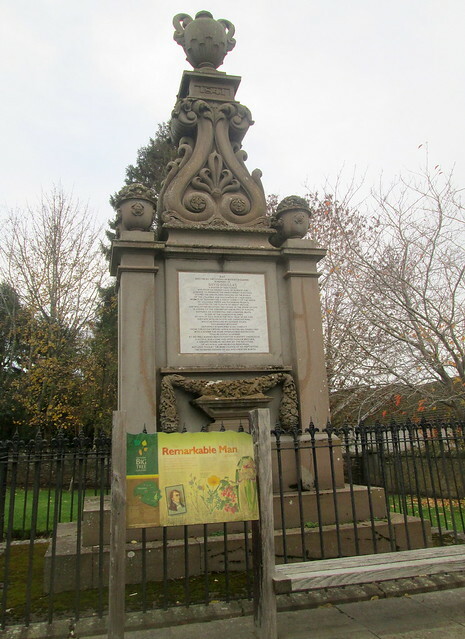 This entry was posted in Gardening, Scottish History and tagged botany, David Douglas memorial, Perthshire, plant hunter, Scone by Katrina. Bookmark the permalink. What an awful way to die! I’ve read about Douglas and knew that the Douglas fir was named after him. I like reading books about or by those adventurous plant hunters. Quite a lot of them had sad endings on their plant hunting expeditions with disease, broken limbs and violent natives taking their toll.